Four years in a row has this blended Japanese whisky been awarded a Gold medal in the International Wine & Spirits Competition. Consistent, and consistently great. More info can be found HERE, if you speak Japanese. Chris Bunting's Nonjatta is a great site (in English) for Japanese whisky as is Takeshi Mogi's Japanese Whisky Web. Misako Udo, author of the amazing The Scottish Whisky Distilleries is set to release a book about Japanese whisky distilleries just as soon as she finishes it. 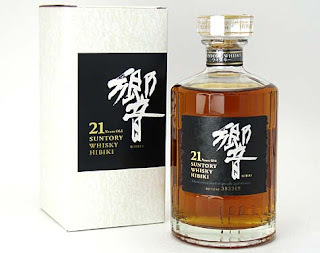 For other whiskies from Japan had on the mission click HERE. Have a nice weekend and please stay calm if you must engage the pre-Christmas mayhem. Confectionery, candied nose with a luscious maltiness. A sour yeastiness acts in perfect balance to the sweetness. Carmelised, nutty, and really juicy. Sensual and buttery. Hard peach and pipe tobacco. Dry, spicy oak. Sweet, yes, but with a toasty, smoky, oaky element to keep it all from becoming tart. An absolute delight to stick your nose into, if a bit sweet for some. But it is as if every odour (apart from the more phenolic ones, peat, rubber, etc.) you think of can be ticked off as present. Unbelievably balanced, and dangerously drinkable. Is this to be consumed Japanese-style? Stupidly, I tried it, and it is an absolute waste as a Mizuwari. Is it OK if I cross post this review on Nonjatta. I am short of a 21 review. Also would like to add your comments on Ginkgo, if that is OK?? ?